becerradas : animals between 18 and 24 months are fought by professionals or aficcionados with or without killing them. A president oversees the fight, ensuring that the regulations are respected. The 'paseo' (or parade), introducing all the actors in the bullfight, begins when the trumpets sound. When the bull comes out of the 'toril' (bull-pen), the bullfighter receives it with the cape, enabling him to judge it during the first seconds. The "tercio de pique" : the picador, riding a protected horse and armed with a lance, will test the bulls strength by pricking it on the top of the "morillo" (bulge on top of the bull's neck). The "tercio de banderilles" : the banderillos ( bullfighter assistants) stick three pairs of banderillas into the bull's shoulders, in order to make it move. If it wishes to, the matador himself can stick the banderillas into the bull. 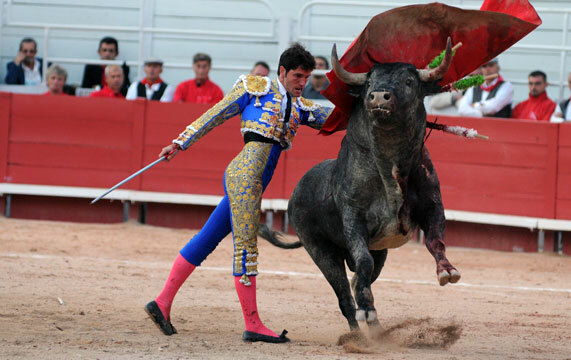 The "tercio de combat" or "muleta" : is the moment of truth for the matador. He must in a few minutes make the bull submit, bringing himself into harmony with it before administering the final blow.